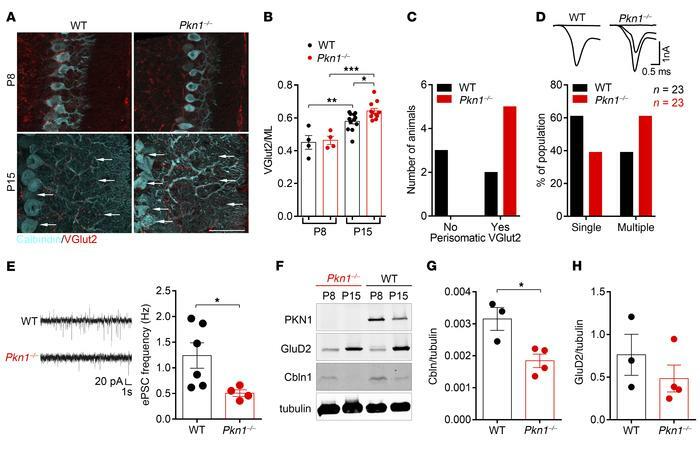 Pkn1–/– mice show a defective PF-PC synapse formation during development. (A) Cerebellar vermis sections of P8–P15 animals (n = 4–12). Arrows mark distal and perisomatic varicosities of VGlut2-stained CFs. Scale bar: 50 μm. (B) The ratio of the VGlut2-stained CF innervation depth (μm) to the ML thickness (μm) was analyzed [1-way ANOVA with Newman-Keuls multiple-comparisons test, F(3,27) = 16.7, P < 0.0001, post-test *P < 0.05, **P < 0.01, ***P < 0.001; n = 4 WT, 4 Pkn1–/– animals for P8, n = 12 WT, 11 Pkn1–/– animals for P15 from 5–8 litters per group]. (C) The score of PC perisomatic VGlut2 staining in P15 animals [χ2 test = 4.286, P = 0.0384, n = 5 WT, 5 Pkn1–/– animals from 5 litters per group]. (D) CF-induced ePSCs were recorded from PCs in acute slices. With increasing stimulation strength, ePSCs were obtained in an all-or-none fashion (single CF) or in 2 or more discrete steps (multiple CFs) [χ2 test = 9.68, P = 0.0019, n = 23 WT, 23 Pkn1–/– cells from 7 P15–P17 animals per group]. (E) Spontaneous PC ePSC frequencies [2-tailed unpaired t test with Welch’s correction, t(5) = 2.865, *P = 0.0352, n = 6 WT, 4 Pkn1–/– cells from 3–5 P13–P15 animals per group]. (F) Western blot analysis of Cbln1 and GluD2 levels (n = 3–4). (G and H) Analysis of the Cbln1/tubulin ratio (G) [2-tailed unpaired t test, t(5) = 3.365, *P = 0.0200, n = 3 WT, 4 Pkn1–/– extracts from 3–4 animals per group] and GluD2/tubulin ratio (H) [2-tailed unpaired t test, t(5) = 1.016, P = 0.3561, n = 3 WT, 4 Pkn1–/– extracts from 3–4 animals per group] in P15 animals. Data are presented as individual n values with mean ± SEM. All analyses/experiments except F–H were performed in a blinded manner.